The key phrase in the first stanza of the US Marine Corps Hymn is First To Fight for Right and Freedom. They are known around the world as the guardians of right and freedom. Read the novel and you will discover the early beginnings of this world-renown organization. 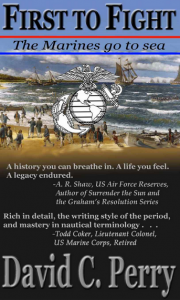 “Meticulously researched, historically accurate and well written tale of the American Revolution and the operational birth of the U.S. Navy and Marine Corps team. With David Perry’s First To Fight, the reader steps back in time to meet the powerful personalities, little known patriot volunteers and their British opponents surrounding the 1775 birth of the United States Marine Corps in a Philadelphia tavern, the Continental Navy and the conduct of the first American naval expeditionary operation “from the sea” against the British Colony of New Providence (Bahamas). This year, a leap year in both the Julian and Gregorian calendars, opened with a great show as far as the Anglo world was concerned. Philip Astley debuted the first modern circus in London, complete with galloping horses and acrobats. 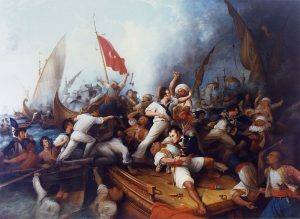 Two events of more significance occurred later that year which foreshadowed America’s revolt against the British government. In February, Samuel Adams and James Otis Jr. would write, and the Massachusetts House of Representatives would pass, what became the “Massachusetts Circular Letter.” In response to Crown import duties on glass, paint, paper, lead, and tea, Adams and Otis wrote that the new taxes violated the British Constitution because colonial residences were not represented in Parliament. The letter circulated to the other American colonies and was favorably received in Virginia, New Jersey, and Connecticut. It prompted the home government to establish a new cabinet position of Secretary of State for the Colonies to deal specifically with the American Colonies. Elsewhere, Russia begins a long war with Turkey and several small kingdoms in Asia unite to form the modern country of Nepal. In August, Captain James Cook will set sail from Plymouth on his first voyage of exploration and discovery. An early signal of the demise of the golden age of imperialism is that the 162-year reign of the Dutch East India Company is coming to a close in Indonesia. The flames of revolution would blaze higher as the year in North American began to wane. The new British Secretary for the Colonies would send regular troops and warships to Boston in the autumn. By year’s end, Boston would see their Assembly dissolved, violent protests and assaults on Crown customs officials, and two thousand British troops living among the populace. Would you sacrifice your comfortable life of privilege to risk it daily in a cause larger than yourself? Would you give your personal fortune, the largest on the continent, to ransom the freedom of friends, neighbors, and strangers? Enter the world of colonial America to share the risks and danger of the early Americans who did these very things. They gambled their lives, their fortunes, and the sacred honor in a life and death struggle with the largest, most powerful empire the world had ever know. A Philadelphia socialite who became the first commandant of the Marine Corps, Nicholas was born in Philadelphia in 1744 to Anthony and Mary Nicholas.. Anthony was a blacksmith. Samuel may have sailed on merchant ships for Robert Morris as a supercargo. On November 28, 1775, he became the first, and therefore senior, officer in the Marine Corps. Congress promoted him to major in June 1776. In 1778 he married Mary Jenkins. He was a Marine, real estate speculator, innkeeper, Quaker, and Mason. Major Nicholas died on August 27, 1790. Howe was posted captain of the Glasgow on January 11, 1775. He commanded Glasgow at Boston and at the Battle of Bunker Hill in June 1775. Shortly after that, he took his frigate to Rhode Island. Tyringham was first commissioned lieutenant on September 10, 1765, four years later being promoted to commander of the sloop Vulture-14 on 28 December 1770. In September 1772 he took his sloop, Cruizer-8, to the North American station. Captain Howe later saw significant service in North America commanding Thames-32 until she paid off in 1782. He died the following year in 1783.